lower section (as shown in the diagram, left). These upper and lower halves are locked or unlocked (with one-way ratchets), depending on the direction of rotation of the upper section. While both upper sections always rotate, the lower section rotates only on the locked wheel. With the central rotor moving clockwise, only the right click-wheel is locked. With the central rotor moving counterclockwise, only the left click-wheel is locked. 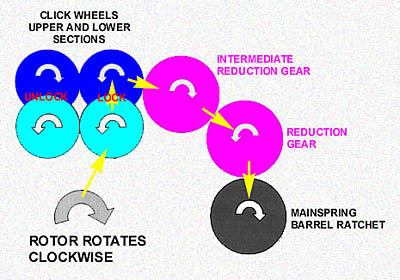 This is the difference that allows the mechanism to utilize rotor rotation in both directions. 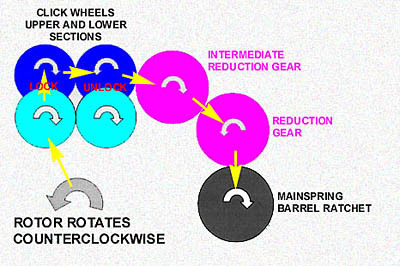 The upper illustration shows power flow (yellow arrows) with clockwise rotor rotation, the lower with counterclockwise rotation.